Let’s get two indisputable facts straight: Wario is the best Mario universe character, and WarioWare is Nintendo’s most experimental and consistently brilliant series. Ever since its still-excellent debut on the Game Boy Advance, these manic micro-game collections have been used as proofs-of-concept for all sorts of wacky Nintendo ideas—from gyroscopic tilt controls, to the Wii’s motion controls, to touchscreen input, and even online services built to share player-generated levels—and the results have always been some of the most exciting, novel examples of what developers can do with those technologies. WarioWare Gold is somehow the first and only installment on the 3DS, and it’s reaching back through the series’ history to cherry-pick games that take advantage of nearly every feature on Nintendo’s long-lived Swiss Army knife of a handheld system. Between those classics and a slew of new bite-sized creations, Gold sports the most micro-games in the series’ history. Hopefully, it’s a precursor to an even wilder debut on the Switch. Overcooked should be counted among the great sleeper hits of the last few years. Those who made time for its frenetic collaborative cooking were treated to a masterpiece of modern couch-co-op multiplayer, one that demanded intense communication and a whole lot of forgiveness for your partners’ panicked mistakes. This is a sequel of the bigger and better variety, but with a base game that good, what more could you ask for? Dead Cells is already a hit, and a worthy one at that. Its combination of the permanent death and procedurally assembled levels of roguelikes with the sprawling maps, melee combat, and permanent upgrades of Castlevania made it one of last year’s runaway Steam Early Access hits. This month, it’s finally getting a full release—and making its way to consoles to boot. For those of us not in the cult of Madden, its arrival every August is merely a sign that the summer gaming doldrums are finally over. But this year’s installment does have a few interesting things going for it: EA has focused on reworking the series’ running game, leading to players having momentum that looks much more natural and satisfying; it’ll include the series’ second and much-expanded attempt at a dramatic story mode; and for the first time in more than a decade, the game will be coming to PCs. 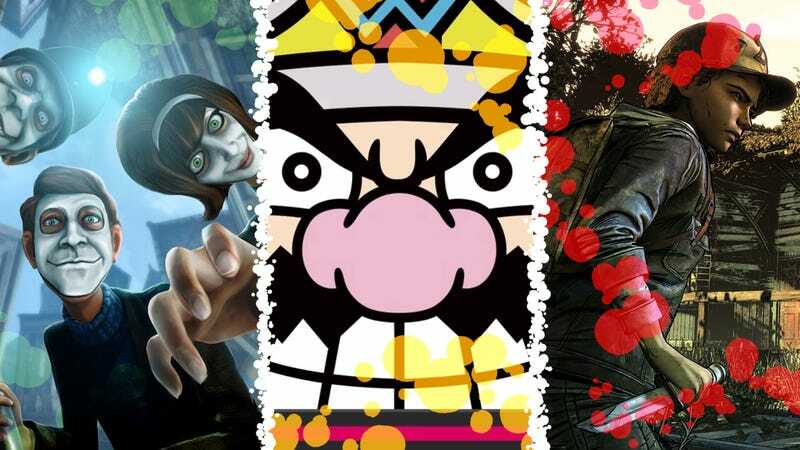 We Happy Few is the most fascinating, high-profile example of how the reception to games that launch while in development can end up shaping the final product. With its distinct setting inspired by British dystopian classics like The Prisoner and Brazil, it made a big splash on Kickstarter and an even bigger splash when Microsoftf debuted the game’s flashy opening scene on stage at E3 2016. But when the in-development version of We Happy Few was released a month later, focusing exclusively on the game’s procedurally generated survival sandboxes, players were disappointed it didn’t seem to be the elaborate, narrative-focused BioShock-like experience many expected. Since then, the game got a publishing deal, prompting its developer to expand its staff, widen the project’s scope, and soften the harsh roguelike elements that could get in the way of all the psychedelic story bits that made people interested in it to begin with. Death’s Gambit joins the likes of Salt And Sanctuary in the family of games attempting to filter the demanding swordplay and dense, gloomy world of Dark Souls down into a 2D action RPG. It’s the first project from the five-person team at White Rabbit, and grew out of a prototype the company’s lead designer first assembled six years ago. It’s since been picked up by Adult Swim Games and expanded into a side-scroller that adheres as closely as possible to the FromSoftware formula: a stamina meter to manage, lots of weapons with different animations you’ll have to learn, dark fantasy art, huge bosses, limited healing items, loot that comes with paragraphs worth of backstory attached. You know the drill by now. It’s hard to believe Telltale’s Walking Dead is entering its fourth—and supposedly final—season. After receiving near universal praise for its gut-wrenching debut series, the games seemingly lost steam and fell out of favor. But there’s at least an interesting narrative subversion at the heart of this finale. As with seasons two and three, The Final Season stars Clementine, the zombie apocalypse survivor introduced to us as a girl in season one. There, she was the ward of Lee, who became an accidental father figure, teaching her how to survive in this messed-up world. She became the level-headed protagonist of the next two seasons, and now it’s time for her to take on the role of guardian and teacher for a child who happened to end up in her care. With new games taking over the zeitgeist on a biannual basis and Overwatch and Hearthstone still going as strong as they are for Blizzard, it’s easy to forget World Of Warcraft is still chugging along. Battle For Azeroth is the seventh expansion for the studio’s revolutionary MMORPG and follows the dramatic events of Legion, which opened up a new, especially heated chapter in the everlasting war between the Alliance and the Horde. In the game, that’ll take the form of new “warfront” battles, where 20 players come together to lead big, sweeping skirmishes inspired by the classic Warcraft games. Phantom Doctrine is a Cold War game that has it all: oodles of intrigue and betrayal, cool spy gadgets, and most importantly, enormous ’80s hair. It’s built to play like XCOM, with you running both the headquarters and turn-based missions of a shadowy spy organization. Naturally, stealth is key during those tactical operations, but there’s more to it than slinking around behind waist-high walls. Some of your agents can start missions off the map, tracking enemy locations from afar or picking them off with a long-distance rifle. Better yet, an agent can be planted undercover and behind enemy lines, giving you a chance to silently clear out enemies before your team can ever get into danger or just go ahead with some good, old-fashioned sabotage. Guacamelee’s ethnic stereotypes, good-hearted as they might be, haven’t aged terribly well—the lead female character is named Tostada, for crying out loud—but underneath those questionable choices is one of the finest Metroidvania games of the last decade: part ode to ’90s beat-’em-ups, part tough-as-nails platformer, all stuffed into a sprawling, colorful world loosely inspired by Mexican culture. The sequel won’t be straying too far from the original’s winning design, but with a foundation that good, the promise of more is exciting enough. Maybe the developers could tone down the meme references this time around, though? Little Dragons Cafe is a new game from Yasuhiro Wada, best known as the creator of Harvest Moon. Like that beloved series, it’ll have plenty of farming for you to do, but it’s more focused on building its characters and telling the story of the misfits who staff and frequent the titular cafe. You’ll play as one of two twin siblings who take over their mother’s small restaurant when she falls ill. So you go harvest ingredients, cook food through a rhythm mini-game, and serve it to patrons. There’s also an adorable little dragon to raise. From Smash Bros. to Capcom’s Versus series, there are few things like a good crossover fighting game, and Blade Strangers is an unexpected but welcome one. Aside from a couple original combatants, its roster is full of characters from a handful of independent titles, many of which were distributed by its publisher, Nicalis. It includes the naked baby from The Binding Of Isaac, the fishing-hook toting sushi chef from Umihara Kawase, Gunvolt of Azure Striker Gunvolt, a few scantily clad ladies from Code Of Princess, the two main characters from Cave Story, and a buff-as-hell rendition of Shovel Knight. Ben Esposito’s Donut County is a game where you play as a hole. You show up in animal people’s lives and start sucking up their Los Angeles-inspired world, and eventually the locals themselves in a sort of reverse Katamari Damacy frenzy. It’s all very cute, with its anthropomorphic characters and pastel colors and the surprising recombinations that pop back out of the hole. But that whimsy acts as a mask for the destructive reality of your actions, and Esposito’s larger goal is illuminating that tension and maybe even trying to say something about the invasive, life-altering forces that affect communities all over the country. The Yakuza series has only strayed from Sony consoles once in its 13-year history (for a Wii U rerelease of the first two games that never left Japan), but as Sega looks to keep expanding its PC offerings, the publisher is finally introducing a new audience to its mobster melodramas. Best of all, Sega is starting with the series’ most accessible entry point: Yakuza 0. Set among the smoky, neon glow of ’80s Tokyo, it’s the very first chapter in the long, twisting saga of Kazuma Kiryu, giving new players an introduction to this thug with a heart of gold and the weird, violent world he can’t quite escape. Shenmue is a lot of things: an ambitious labor of love that, at the time, had the highest-ever budget for a game; a divisive experiment in early open-world design and embracing the mundanity of everyday life; and a game whose memory has been kept alive more by mockery than appreciation. Now, it’s also responsible for one of the most successful Kickstarter campaigns of all time, the result of which, Shenmue III, is currently slated to release in 2019, 20 years after the series’ debut. In the meantime, Sega, which is not involved in the new sequel, has readied a spruced up rerelease of the first two games. Aside from the inclusion of both English and Japanese language tracks, they’ve been left in their original states—which means, yes, you’ll still have to buy capsule toys and twiddle your thumbs while you wait for stores to open or buses to arrive in Shenmue I. You’ve been warned. Generations Ultimate is in an odd position. Monster Hunter: World broke beyond the series’ cult following and shockingly became one of the best-selling games of 2018. But much of that success can be owed to World’s streamlining and modernization of the series. Generations Ultimate, on the other hand, is an expanded rerelease of Monster Hunter Generations, which hit the 3DS several years ago and has more in common with older Monster Hunter titles than World. It does have one huge advantage, though: Monster Hunter: World didn’t come to the Switch, a console that was practically tailor-made for these grind-heavy dino-fighting excursions. What’s this? More Yakuza? Yep. For fans who do have a PlayStation 4 and are looking to fill in the blanks between Yakuza 0 and Yakuza 6, Sega has started remaking earlier games in the series using its newer technology. Kiwami 2 takes the second game, feeds it through Yakuza 6’s engine, and adds in a bunch of new features, including the gang warfare mode (and New Japan Pro Wrestling fighters) from 6, some alterations to help streamline the story, and a new side chapter starring fan-favorite one-eyed madman Goro Majima. Dense, flexible, full of morally gray decisions, and sporting co-op for up to four players, Larian Studios’ Divinity: Original Sin 2 was one of 2017’s most acclaimed games and heralded as a high point of the modern computer RPG revival. A year later, Larian has readied a huge update—labeled the Definitive Edition—that provides “thousands” of tweaks, including a new tutorial, enhancements to the user interface, and a new difficulty option. And alongside the update’s rollout, the game will be coming to consoles for the first time.